Fishing is an activity which serves multiple purposes. It can be done as an enjoyable hobby, but it can also be a means of survival. Either way, in order to have the most optimal fishing experience, it’s important to have the right equipment. To catch fish, you need your rod, but what about everything that comes before and after the actual catching? That’s where the best multitool for fishing comes in. 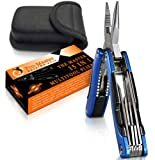 Before you search for the best multitool for fishing, it’s vital that you know how to use one of the most basic fishing tools you will need to get by pliers. No matter what type of fishing you’re doing, pliers are the one tool that is an absolute must. There are many important uses for pliers while fishing including unhooking a fish, cutting fishing lines, and tightening hooks. Pliers even serve as a backup tool in an emergency situation such as catching yourself on a hook. To get started, use the handle of the pliers to open the jaws. Press the nose of the pliers between the split rings to open them. Hold the pliers firmly around the ring so the split ring is open to change hooks. Use the pliers to hold open the split ring while you change the old hook with a new one. Once you’ve put the new hook on, remove the pliers from the ring. You can use your pliers to help you remove and replace dull and damaged hooks. Another one of the main reasons to become familiar with using fishing pliers is to master the art of unhooking and throwing a fish back without injuring the fish. This will take a bit of time to get down, but once you do, your fishing experience will be enhanced and things will move faster. Once you get the hang of using fishing pliers, all the other tools on your fishing multitool will add more value to your fishing work. The Piscifun Fishing Pliers are a tool that can be used by fishers of any level. This affordable tool is made of high-quality, anti-corrosion aluminum and will become your go-to tool while fishing. 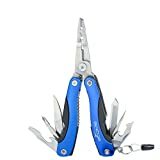 These pliers are made to give you a lightweight feeling in your hand while providing you with full control as you unhook fish and perform other important tasks. The jaws of these pliers are outfitted with a split ring tip to help you remove hooks and split rings as needed. The pliers come with a nylon sheath, coiled lanyard, and belt loop clasp, making them super easy to carry with you on any fishing trip. The ProMaster Multitool Knife is a tool that you may be interested in if you’re fishing purposes are linked with survival needs. This portable tool has 15 different functions, all of which will come in handy in various survival and emergency situations, including the need to fish for food. This tool includes pliers, which will help you perform critical fishing tasks, and the knife is another tool that you are likely to pull out while fishing. This compact tool comes with a carrying pouch and a belt strap holster for your convenience. The multitool is affordable, easy to use, and equipped with a variety of useful tools. You will find that you use this tool for both indoor and outdoor tasks. The Booms Fishing Multitool is a model that was built with fishers in mind. If your survival depends largely on fishing and managing the outdoors, this tool will be a helpful companion. The multitool is made of strong steel that will resist rust and erosion to last for years even in rough conditions. This tool is easily locked and comes with a nylon sheath for storage when you’re not using it. The Tacklife Multitool is an affordable option with 13 helpful functions, including pliers for your basic fishing needs. The tools are made of durable stainless steel and all the extra tools, other than the pliers, lock into place when not in use, for added safety. 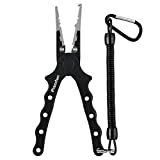 This multitool comes with a nylon sheath so you can easily keep it with you at all times, which you may want to do, as it offers much more than just help with fishing. Keeping the Tacklife multitool on hand will serve you well in the event of emergencies or unexpected survival situations. RAVPower has created a sleek and durable multitool that is both affordable and effective. 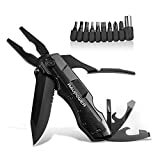 This tool includes pliers, for your hooking and fishing needs, and an assortment of other tools which will prove useful in a variety of situations. This multitool is made with an ergonomic handle which is suitable for both righties and lefties. When you return from fishing, keep your multitool handy to use in and outside your home base. Having a reliable multitool is a must for fishing that will serve you will in general when it comes to survival. Assess your equipment collection and decide what features you want your fishing multitool to have.